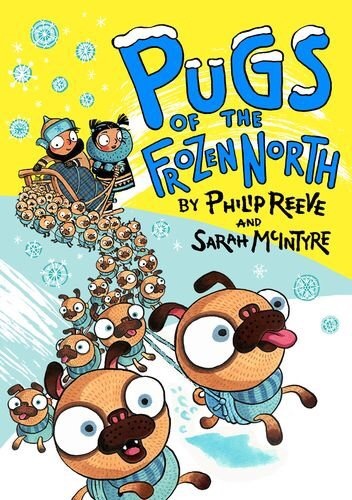 Pugs of the Frozen North is the third collaboration between writer Philip Reeve and illustrator Sarah McIntyre, after Oliver and the Seawigs (reviewed on this blog) and Cakes in Space (one of my top books of 2014) and it’s the best yet – assuming you like pugs. I think pugs are great, with their comical expressions and tilting heads and little legs, but some people don’t like them at all. So be aware – if you don’t like pugs, avoid this book, because it contains pugs. Many pugs. 66 of them, to be exact! When Shen is left abandoned in the frozen north after his ship is caught in the sudden (magical) ice, along with a shipment of shivering pugs, he finds help from Sika, who is in desperate need of dogs for her sled – the Great Northern Race is on. But no-one has ever harnessed pugs before. They’re so much smaller than other dogs. How will they manage? By harnessing all 66 pugs, of course! So begins the Great Northern Race, which is basically the Wacky Races version of the Iditarod. The participants are definitely a wacky bunch – Professor Shackleton Jones with his robot dogs and SNOBOT; Helga Hammerfest with her luxuriant beard and sled pulled by polar bears; the dastardly Sir Basil Sprout-Dumpling and his butler Sideplate; and the glamorous Mitzi von Primm with her poodle-coiffured huskies. The ultimate goal is the Snowfather, who (legend says) can make the winner’s wishes come true. But who will make it there first? If you’ve read the previous two books, you’ll recognise the style of combining story and art. To call these books simply “illustrated” just doesn’t go far enough. Many pages contain a melding of words and pictures that makes it impossible to separate them. 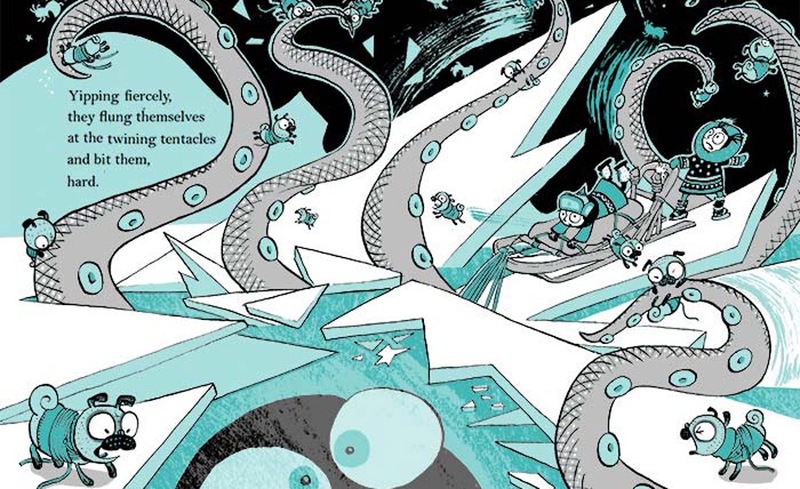 Sarah McIntyre has been at the forefront of a campaign to get illustrators the credit they deserve – her hashtag is #PicturesMeanBusiness – and producing work like this that simply can’t be ignored must be helping her cause. I’ve done my own little bit – I wrote a blog post about the cover of my forthcoming book to show my appreciation of the cover designer and to thank the Dundee school girl who provided the artwork that inspired it – and someday I hope to write a book that’s given the full illustrated treatment, so it’s in my interests that her campaign succeeds. So there you have it – another great book from the team of Reeve and McIntyre. I’m enjoying the format where each book is standalone, but the tone and format remains similar, so fingers crossed for more collaborations to come in this series.